At first glance it is difficult to work out exactly what Yoon-Suin - The Purple Land is. The lack of a blurb means that the potential buyer will be without a clue and even after he has read inside the book’s front he will know no more than that it is a ‘Campaign Setting’. What Yoon-Suin is, is explained in the book’s opening travelogue, ‘The Journal of Laxmi Ghuptra Dahl - Being an account of a traveller in distant places’. This details his journeys in the Yellow City, the great metropolis at the mouth of the God River ruled by the haughty Slug-men, home to unknown numbers of ancient libraries, temples to a thousand gods, opium dens supplied by the seventeen cartels, tea houses, and Crab-men Fighting Stables—the only free Crab-men are to be found in the Topaz Isles that stretch across the Gulf of Morays to the south of the Yellow City. From its location at the mouth of the God River, the Yellow City merges into the thick forests of the Lahag, beyond which lies the rich plains of the Hundred Kingdoms, whilst the God River leads deep inland to the wild borderlands of the Druk Yul whose upper reaches are said to be home to dragons! In terms of characters, Yoon-Suin presents four Races—Crab-man, Dwarves, Humans, and Slug man. The Crab-man is a sentient crab, strong and tough, typically used in manual labour or trained and kept in a Crab-man fighting stable, but cannot read or speak or manipulate magical items. It can understand spoken languages and can communicate in rudimentary terms. In game terms, the Crab-man has its own quite simple Crab-man Class. Dwarves are warriors or adventurers (fighters or thieves) whose people have been forced to flee their homeland, the Mountains of the Moon, for reasons that they cannot agree upon. Humans are free to take any Class, whilst the Slug-man is either a holy-man or magician (cleric or wizard). Notably in the Yellow City—and in many of the Hundred Kingdoms—there is a strict hierarchy. The Slug-men rule—merchants, crime families, sages, poets, tax collectors, bureaucrats, etc.—whilst the Crab-men are held in slavery. This means that if one is taken as a Player Character, then another Player Character must be selected as his master. In between there is the possibility that even Humans are slaves. Of course this does not mean that a player could not play a Race or Class from a traditional Dungeons & Dragons-style fantasy setting. There would have to be a good reason why such a character would be in such an isolated land as Yoon-Suin, but for a group of adventurers to this strange new land, the supplement suggests that it can be run as a ‘foreigners fresh off the boat’ campaign a la Tékumel: Empire of the Petal Throne. That said, the Dwarves do feel slightly out of place given the exoticism of the other two options in terms of Races and even then, the inclusion of the Crab-man adds relatively little given their lack of capacity for communication or character growth. Yoon-Suin includes some sixty or so monsters, of which the majority are new. Even interlopers from traditional Dungeons & Dragons are given their own Purple Land spin, so the Kenku are tricksters who can have crow, kingfisher, or peacock heads; the Mi-go are carnivorous white ape-like creatures that prey upon yaks and their herders; Nymphs may be beautiful, but their frost or water natures means that their chosen lovers typically drown or freeze; and the Ogre Mages are found trading far and wide, but are bound to the haunted city of Syr Darya. The remainder are a fantastic mix of strange demons, spirits, the undead, and more, such the Masan, long-shadowed child vampires that like to deceive; the Ice Ghost, the tortured, screaming soul of someone who died in an avalanche or snowstorm; Figments, imp-like spirits born of the hallucinations of opium eaters; Baital, hostile and manipulative spirits that inhabit and animate corpses whilst sometimes posing as demigods; Mountain Witches who appear as nubile, young women to enslave men, whilst women can see what they are; and self-Mummified Monks who may help or hinder depending on their Alignment. In places some of these monsters do feel slightly underwritten, but what really is a shame about them is that none of them are illustrated when so many of them are begging for this treatment. The bulk of Yoon-Suin - The Purple Land is devoted to four identically structured chapters, each one devoted to a different region, in turn, ‘The Yellow City and The Topaz Isles’, ‘The Hundred Kingdoms and Láhág’, ‘Lamarakh and Lower Druk Yul’, and ‘The Mountains of the Moon and Sughd’. So for ‘The Yellow City and The Topaz Isles’, the chapter opens with tables for creating the Player Characters’ Social Circle, such as a shrine, Crab-man fighting stable, noble house, tea shop/opium den, exploring guild, philosophical society, and so on. In many cases each table is prefaced by a paragraph or two describing the role of the place or thing or person given options in the table, just enough information to spur the DM’s creative processes. There are tables for establishing a conflict between one or more of these locations as well as tables that develop each of the location types. Other tables add Yellow City Personages, General Rumours and Hooks, Yellow City Rumours, Random Locations and Locations ‘Round the Yellow City, and Neighbourhoods. Even more tables detail the outskirts of the Yellow City , adding Lairs, personages, and so on and so on. All of these are designed to be used to help the DM create places, relationships, rumours, and hooks around which to build a campaign, but there are also eighteen more fully described locations/encounters that be dropped into a hex on the DM’s map with little need for modification. Lastly, Adventuring in the Old Town presents a set of tables to create encounters and places in Old Town, the abandoned and decrepit region of Yellow City that is ripe for exploration. Then in turn, Yoon-Suin does the same for each of other regions, though with some variation. Thus ‘The Hundred Kingdoms and Láhág’ begins with tables for creating each one of the Hundred Kingdoms, its assets and issues, and the Player Characters’ Social Circle, and so on and so on. What this means is that Yoon-Suin - The Purple Land contains an awful lot of tables—and that sounds dull. This though could not be further from the truth, for these tables are rich in content and ideas, let alone the twenty or so more fully described locations/encounters per chapter that are but ready to play. The tables enable the DM to mix and match ideas that can be used to lay the foundations of a campaign and then develop it further as the campaign progresses. Of course, there is nothing to stop the DM from forgoing the dice and simply using the content of the tables as inspiration. 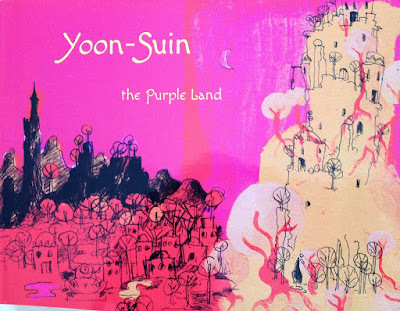 Rounding out Yoon-Suin - The Purple Land is a set of appendices. These provide further details on various aspects of life and society in Yoon-Suin, including poisons, opium, specialist teas, conducting trade, a set of rough and ready psionics rules, fortune telling, typical Dungeons & Dragons monsters to be found in Yoon-Suin, useful worms, arachnids, and insects—used as labour in Yoon-Suin and beyond, magical tattoos, and more. So need to know the particular opium that a gang specialises in smuggling or a shop serves? Then there is an appendix for that, detailing the opium’s colour, effect, and how it is administered, for example Blue Opium is a depressant that is crushed and made into a tea, which might deaden fear or pain or the mind against illusions or slows the flow of the blood to slow the spread of poison. There are six colours of opium and they all have varying effects. Specialist teas have a similar effect. Two of the more interesting appendices actually describe the Yellow City Trade Tongue and other languages that add to the cultural flavour of Yoon-Suin, whilst Appendix N of course lists the books, music, and games that form the supplement’s inspiration. As a physical object, Yoon-Suin - The Purple Land is an oddity. Its bright pink cover is slightly overshadowed by its landscape rather than the traditional portrait format. The book is cleanly laid out and in general well-written, but its maps are somewhat lacking. The pen and ink drawn maps feel suited to the setting and general milieu, but are too small, whereas the hex maps of each are are just indistinct and difficult to read. Yoon-Suin is lightly illustrated by Matthew Adams. Now Reviews from R’lyeh is not necessarily a fan of Adams’ style, which can often veer into being scratchy doodles, but here they pleasing capture the exoticism of the setting. As rich and as detailed as Yoon-Suin - The Purple Land undoubtedly is, it does suffer from a certain inaccessibility, both its exoticism and its lack of upfront explanation, contributing greatly to that, let alone the odd format or the weirdness that puts it well outside of the traditional Dungeons & Dragons-style campaign. Of all of these issues, it is the lack of upfront explanation that really makes it inaccessible, which is a shame given the richness of the supplement’s content once past this hurdle. Another way that this could have been addressed is by including a set of tables for handling the set-up and beginning of the ‘foreigners off the boat’ campaign that is suggested as the default. That might have eased both players and their characters into the setting without overwhelming either with the culture shock. Other than that, if there is anything missing from Yoon-Suin, then perhaps a table of weapons native to the area and some native magical items would have been worthy inclusions. Behind the vibrantly pink cover of Yoon-Suin hides a campaign setting rich in ideas and inspiration, waiting to be plucked and given flesh by the GM. Weird and fantastic, alien and exotic, but also accessible—once the presentation issues have been overcome—and original, Yoon-Suin - The Purple Land is a thoroughly impressive toolkit and a brilliant addition to the Old School Renaissance.